When my dream to play professional soccer on the world stage disintegrated after a series of debilitating injuries, I had no back up plan. My career and everything I’d worked for was over. I reinvented myself as an ultra-endurance adventurer and discovered my superhuman ability to withstand extraordinary conditions and excruciating pain. From the searing heat of the Sahara Desert to a typhoon-ravaged remote island, my drive to constantly test my limits stunned my family, friends and fellow athletes. Then came the Ultimate Triathlon – a solo 12-day, 2000-kilometre triathlon across multiple countries that most considered impossible. But, I kept a secret behind my reinvention. For years I concealed a diagnosis of clinical depression, this increased my determination to overcome the private torment I was going through with further destructive behaviour. Through it all, I clung to my lifelong motto, to never, ever give up; pushing myself to breaking point emotionally and physically, then rebuilding myself over and over again.For the first time, I openly share how I persevered through some of the darkest moments of my life, and just how close I came to paying the ultimate price. 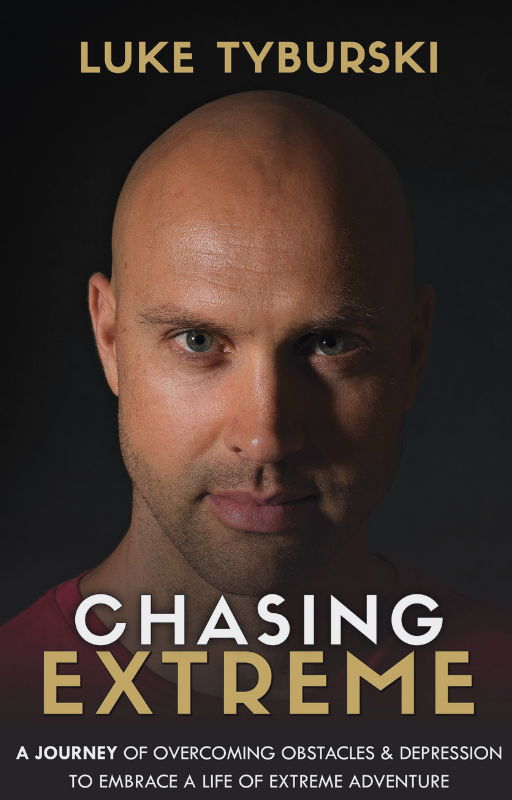 Chasing Extreme is raw, honest and simply my story! Even thought I filmed and edited The Ultimate Triathlon film I still learnt a lot about what Luke went through on the UT. It’s a really well written book and the chapters about the Everest Ultra made me feel sick. I usually listen to audio books but managed to get through this one very quickly and genuinely enjoyed it. Great work Luke. I was curious how to write this review because the book was so intriguing and I personally related to it so much. Luke delves deep into the psyche during “chasing extreme” and is transparent revealing to the reader all of the struggles, mentally, physically, and emotionally. We follow along with his transformation into an endurance athlete and the many races and adventures that he accomplishes. Each race by itself presents adversity while every race also uncovers some sort of breakthrough, whether it is personal, or by other people. The best part of the book, however, is how Luke lets us into the psychological challenges and struggles. It strikes me as so relevant because scores of ultra-endurance athletes struggle with similar depressive tendencies. It is what actually makes them so great at the same time, the ability to never give up, and push through the pain. LOVE IT! It took me six months to finish the latest ‘bestseller’ but I finished this book in three days. An inspiring read, but not always for the reasons you might think. Luke has done some amazing things but also had some great setbacks which, by his own admission in the book, he hasn’t always dealt with very well. Luke writes very honestly and you feel a part of the adventures, both the ups and the downs. This is not the autobiography of a superstar sportsman, but it is the story of someone with talent, determination and dreams who you can really relate to. I hope there is another chapter to this story in a few years. Thanks for a great read! After finding out that Luke was writing a book about his adventures I was so keen to give it a read, especially after watching the ultimate triathlon! Reading through the book and being able to go on the journey with Luke as he progressed and developed through the many ups and downs in order to achieve some huge goals really opened my eyes to all the amazing things that are out there but also just how much effort and work needs to go into them. Luke’s book has thoroughly inspired me to chase my own dreams and my own extreme, his book has also made me realise that being mindful of the people and the world around you is important! An amazing read, very inspiring and a book i will continue to read over and over again. When Luke says its ‘raw & honest’ – it is! And when he says he kept his diagnosis concealed – he did! It is also a very very readable book and very authentic of who Luke is. You don’t have to hurt yourself, however, dreams are not always easy and it takes courage and determination to keep on going to obtain your dreams. Luke has those two in spades. It’s not always a ‘comfortable’ read, however, you will find its worth it.